Giving people the ability to communicate values for strengthening the family in today’s society through education – that is the main mission of the Pontifical John Paul II Institute. The institute, which is headquartered in Rome, has branch campuses on every continent. The Benin campus is celebrating its 20th anniversary. Representatives of Aid to the Church in Need paid the campus a visit. The foundation offers more than 120 scholarships as part of its support of the African institute of theological studies. The Kanga family from Cameroon is a good example of how the institute named after Pope Wojtyla works. Thanks to one of these scholarships, the married couple was able to make the trip from their country to Cotonou, Benin, with four of their five children. They are currently completing a master’s degree programme for lay people. After three years, they will return to Cameroon to help other families, offering them a professional orientation to help them deal with the problems of today’s society. The Seke family has already finished a course of study at the John Paul II Institute. The married couple has founded the “The Power of Love” centre, which offers engaged couples an orientation for marriage. The pontifical institute would like to serve all of Africa. For this reason, more and more students are coming from all parts of the continent. In Africa, the family still has a high standing, in spite of a general decay in its structure. Classes are held in French; however, plans have been made to introduce further languages such as English and Portuguese. The course offerings will also be expanded to include evening courses to open them up to working students. Aid to the Church in Need has supported the pontifical institute from its very beginnings. The international pastoral charity carries out building as well as book donation projects. Furthermore, it has made available more than 120 scholarships amounting to over €1.2 million. The International children’s prayer campaign “A Million Children praying the Rosary”, which has been supported for several years now by Aid to the Church in Need, has had a particular impact in the country of Benin in West Africa. The campaign goes back to an idea of Saint Pio of Pietrelcina, who in some way foresaw the great spiritual potential of these little ones when he said, “If a million children were to pray the Rosary, the world would change.” This year, for instance in the diocese Natitingou in Benin, the children there have proved him right. At nine in the morning, in every one of the Catholic schools in the diocese of Natitingou in northwest Benin, you would have seen hundreds of children, aged between two and thirteen, gathered in groups to recite the Rosary – their aim this year being to pray for the children of Syria, the innocent victims of a seemingly endless war. Thanks to the now well-established initiative “A Million Children Praying the Rosary” they were united in this with hundreds of thousands of other children all over the world who had likewise responded to the appeal launched by ACN. However, in Benin these groups of schoolchildren had produced an effect of remarkable unity – for here there were not only Catholic children praying at the same time, but also children belonging to various other religions, including Protestants and Muslims. All of them together praying for the grace of unity and peace in the world. At the bilingual Holy Family Catholic primary school in the diocese Natitingou, the children gathered at the Catholic cathedral Cathédrale de l’Immaculée Conception around the Marian shrine of Our Lady of Atakora. Together with their teachers, they began with a Marian hymn and meditated on all five Glorious Mysteries. Each decade was interspersed with joyful singing and praises of Our Blessed Lady. Then afterwards, Father Servais Yantoukoua, the diocesan chaplain to the children’s apostolate movement in Benin (Mouvement d’Apostolat Des Enfants du Bénin), read from a letter specially written to the children for this occasion by Cardinal Mauro Piacenza, the President of ACN. He quoted the Cardinal’s words to them, saying that through prayer “we can build a society in which justice and peaceful coexistence are possible”. Father Servais then went on to explain to the children the meaning of this prayer and the importance of unity and peace in the world, emphasising the example set by the three children who witnessed the apparition of Our Lady in Fatima, Portugal. The Catholic diocese of Natitingou was fully behind this initiative and supported it via its children’s missionary committee. Afterwards the children returned home “conscious of the fact that they need to become spokesmen for the Mother of God in this peace-starved world”, as Father Servais put it. The position of the church in the Democratic Republic of the Congo is difficult, especially in the eastern part of the country, where war has been raging for decades over the coveted raw materials mines. The effects of this can also be felt by Bishop Joseph Mokobe Ndjoku in the northwestern diocese of Basankusu. For some time now, an impressive church building has towered over the surrounding countryside there. A project that Aid to the Church in Need has been supporting for many years. It is now taking on definite shape in the middle of green fields. But the ailing economy, marked by corruption and inefficiency, has left its mark everywhere. For example, in many places the infrastructure is in a very bad state of repair or hardly existent. This means that when Bishop Joseph Mokobe Ndjoku and his employees go out to visit the parishes in his diocese of 77,000 square kilometres, they can often only travel by canoe on the rivers because the streets are impassable. It takes him more than two days to travel about 300 kilometres. National elections are planned for late 2017. However, Bishop Mokobe reports that the preparations for these are stagnating, the round tables at which the church had time and again championed peace talks and the reformation of the bitterly divided camps that make up Congolese society have ceased to take place. The well-known exploitation of natural resources and its devastating impact on the people remains unresolved. One of the main demands of the church has therefore become “to hold the upcoming elections”. However, symbols of hope continue to rise in the middle of this state of affairs. One example is the nearly completed cathedral of Basankusu. With it, more than just a building has become visible and tangible to the local people. A Congolese saying goes, “Without a roof over your head – there is no such thing as community.” As the cathedral begins to rise up out of the field, “this literally establishes the community of believers for the local people,” explains the bishop. After all, this is where they can gather in prayer or for educational programmes, for trade fairs and celebrations, on sunny and rainy days. “For them, the cathedral is a perpetual source of motivation carved in stone to do something for the common good. It symbolises being a part of the large family of believers that stretches beyond national borders.” And it is thus also a link to the benefactors of Aid to the Church in Need from all over the world who have contributed to the funding of this cathedral. At the same time, the new church represents the challenge “for Catholics in the Congo to become active in the Christian spirit for peace,” explains Joseph Mokobe Ndjoku. Which is why he describes the cathedral as the key for further campaigns of this sort – in spite of the austerity of daily life. The inauguration of the church is planned for the coming spring. Sudan’s tiny Christian flock is being swelled by refugees from Eritrea. Sudan – we are speaking of the northern republic, officially the Republic of Sudan, which since 2011 has been separate from the breakaway country of South Sudan – is no longer a Christian country. In fact 90% of the population today are Muslims. In the last few years, however, the tiny Christian flock in the country has been swelled – albeit involuntarily – by tens of thousands of Eritreans, among whom are many Christians and many Catholics. They are seeking refuge here since they can no longer bear living in their own home country. “The regime in Eritrea is forcing people to serve for years, and sometimes even decades, in the army under compulsory military service. During this time they are paid practically nothing and are utterly at the mercy of the regime. It is a situation fewer and fewer people are willing to accept”, explains one of the catholic volunteers who cares for the Eritrean refugees in the capital Khartoum. We are to call him Joseph, since we cannot reveal his actual name. ACN is helping to pay the cost of schoolbooks and teachers salaries, and also the cost of food for the pupils themselves. More often than not their families have very little money to help pay for their childrens schooling. Employers give priority to the Sudanese, so most of the Eritreans struggle to make ends meet in the black economy. They save up every possible penny in the hope of being able to pay for the journey to Europe or some other Western nation for not one of them wants to stay on in Sudan. “Our people are so afraid of the police”, Joseph adds. “We Christians are helpless and at their mercy.” And it is true that many of the refugees again and again fall victim to oppression by the police. Cardinal Dieudonné Nzapalainga of Bangui on the power of the religions to unite people in the fight against the civil war in Central Africa – “To join together like good honey”. For years, rebel groups in the Central African Republic have been fighting for power and raw materials. The “Séléka”, a rebel group primarily made up of Muslims, toppled the corrupt government of Francois Bozizé in March, 2013. In response to the looting and murders, the “anti-Balaka” was formed, a group primarily made up of Christians but no less violent in its approach. More than one million Central Africans have since fled to other countries or other regions of the country. Churches and mosques offer civilians protection against the attacks. French military intervention and UN peacekeeping missions were able to somewhat stabilize the civil war situation in the country so that President Touadéra could be elected in February, 2016. However, over the past few months, the violence has flared up again. The Tagespost newspaper met with Cardinal Dieudonné Nzapalainga, the world’s youngest cardinal at 50 years old, through Aid to the Church in Need in Kronberg. Cardinal Nzapalainga, what did the papal visit to the Central African Republic in 2015 achieve for Christians and Muslims? How would you explain this? The Pope brought peace and hope by visiting Christians and Muslims and bringing them all together in the stadium. I can tell you that his visit was an unforgettable event. The evening before, you couldn’t even get within 5 km of what is called the Muslim ghetto of Bangui, but the pope went in. When he came out again, it was like the Crossing of the Red Sea: just as the Jews passed through the Red Sea, many Muslims followed the pope on foot or on motorcycles – without being afraid. That was liberation, that was an absolute miracle. How are things in Bangui today? Today, you can come and go as you please in the district: the pope went to the Muslims to liberate them from the prison that this district had become. Today, they can go anywhere in the capital city, to the east, the west, the north and the south. Which is something they were once not able to do. That isn’t something that should be disregarded. And we believe that the visit of the pope got the whole world interested in the Central African Republic. Because we had television stations from all over the world there, following the papal visit from that initial event in the mosque, which showed that religion is not the problem. On the contrary, the pope urged the religions to work together to find a solution together. We all share the same progenitor; whose name is Abraham – our father in faith. The same can be said about the Koran and the Bible: we have everything we need to join forces and set out on the road to peace. Now, that whole thing about the “saints” was the doing of the French newspaper Le Monde. The people at the newspaper apparently believe we are saints just because we act like brothers and want to overcome the division. And so they wrote what they did. The other two are Nicolas Guerekoyame-Gbangou, pastor of the Protestant church and president of the Evangelical Alliance of the Central African Republic, and Imam Omar Kobine Layama, president of the Islamic Council. The three of us worked together to build up a forum so that we could say: the word “religion” means “to join together”. One characteristic of religion is that it unites people. The Koran and the Bible contain unambiguous messages that the people should join together – like “good honey”. How can you as religious leaders influence rebel groups such as the Séléka and the anti-Balaka? We appeal to their conscience. We do not have any weapons. Our weapon – that is the Word of God. We are men of the Word of God. We go and knock on the gate to the hearts of the men and women. The people can either accept this or not. It is our job and duty to tell them: thou shalt not kill. And this is what we do when we see people who are killing. We say to them: no, you don’t have the right to kill. God doesn’t want you to kill. And we have to say this to them, and tell them to put down their weapons. We try to disarm their hearts and minds. After all, you may be able to disarm someone by force by taking away their guns – but if he is not convinced in his heart and mind, then he will just go get another gun. That is why it is important to first be sure that he is fully convinced in his mind and then you can start looking for solutions to establish mutual respect. What is the political situation in the Central African Republic under the presidency of Touadéra? Our country is not suffering a religious crisis, but a military and political one. There are those who use religion as an instrument to gain power and access to natural resources such as gold and diamonds. The state has become very weak in Central Africa: 14 of 16 prefectures are controlled by rebels. The rebel leader is the one who holds the real power. He can decide whether a person should live or die. On the subject of diamonds, what do you believe needs to be done to ensure that there is more justice and less corruption in the country? We believe that after everything that has happened in our country, the victims deserve to see justice done. There are civilians who have lost everything. And there are people who have killed and who need to admit that to themselves. The belief that there is a lot of money to be gained by corruption – that needs to be repudiated. Law and order need to be reinstated. We would like to see everyone being held to the laws. We would like to see those who kill people be put in jail. However, at the moment murder is exempt from punishment. Those who kill, don’t go to jail. And nothing changes. Justice must therefore be restored. People are killed for money, for diamonds, for anything and everything. The ones who have the guns are the ones taking the decisions. If you want to have a healthy society, you need to go about it in a different way. You have to set fixed goals for people. Our problems down there are also caused by the natural resources. Central Africa is a country with vast natural resources. People come from all over the world to profit from this and sell the natural resources – to Sudan, Cameroon or Chad. Since the state has no control over anything anymore, the rebels can sell the diamonds in foreign countries and grow rich. The state remains poor. This is why we need to put an end to this situation. We have to build roads, schools and health centres – that is the direction things need to go. Since fighting broke out in May 2017, about 2,000 refugees have sought refuge in the Catholic seminary in the city of Bangassou. What is the situation in the emergency housing of the church? The situation is very difficult, if not to say catastrophic. The people just came and we even took in Muslims from the Séléka. The bishop had the courage to allow all of these Muslims onto his territory. But the young people with the guns want to kill them. That is why he is there to protect them. And thereby risks being killed himself. You have to understand: if someone has nothing to eat anymore, he becomes like a wolf. That is what created this difficult situation. The church is there, it is on site and offering protection, but the church also needs the international community for help. What does it mean to be a Catholic in Central Africa? I often say to people that the Catholic church is an all-inclusive church – and that means: diversity. And if I am really Catholic, then I also need to take in Muslims and do something good for them, I also need to do something good for Protestants – these are all children of God. And that is what we did during the crisis. The imam stayed with me for six months. And when the church supports us here, then it is our job to build bridges between the religions, to the Protestants and the Muslims. We sit down together to pray together, we sit down together to talk about our fears and act together. You also talk about fear? Yes, absolutely. There are a large number of refugee camps in the interior of the country. The people cannot go out on the fields to work. The people can’t go fishing, they are afraid no matter where they go because there is no such thing as safety. And they are confined to their camps. This is why I said that the situation is so catastrophic. The church is there on site, at the side of these people to continue to support them and to stand by them. Thanks to the support of the worldwide church and its aid organisations such as Aid to the Church in Need, we can realise joint projects. Christian children in Sudan’s refugee camps are forced to recite Islamic prayers in order to receive food, according to reports received by sources close to Aid to the Church in Need. A contact, who asked to remain anonymous for security reasons, described how Christian refugees from South Sudan are “in a terrible situation” in refugee camps there. ACN also received reports that it is hard for refugee families to survive on food provided by the government. A monthly food parcel for a family lasts little more than two weeks – leading parents to seek provisions in the local market. Items provided by the UN are sold in the market – many still marked with UNICEF or UNHCR logos. ACN’s source went on to say that the Khartoum government has hampered charities seeking to provide urgent assistance to the camps ad preventing them from overseeing emergency help. He said: “We have heard the story that the government does not allow any other outside agencies to give support, including the Church agencies. The government is very aware that the Church is desperately trying to support those in need throughout the world. In May, 2017 a source who also requested anonymity for security reasons, told ACN: “Churches in Sudan are being destroyed but it’s claimed to just be ‘town planning’. The Church is not allowed to buy property. Reports also note that Church leaders are increasingly concerned about Sudan’s particu lar intolerance towards Christian women. In June 2015, 12 Christian women were arrested as they left a church for wearing trousers or skirts which were seen to be “indecent or immoral dress”. Sudan is the bridge between Africa’s Islamic north and black south – Recently a delegation of Aid to the Church in Need has visited the country. Only in 2016 the charity supported the church with almost half a million Euros. Sudden rumbles shatter the quiet of the evening. The Comboni priests stop eating to listen. They only continue with their evening meal when it becomes clear that the noise was caused by thunder and not by aerial bombs. “This country has gone through so many wars and military coups that you never know what is going on,” an elderly priest, who has been living in Khartoum since the 1950s, remarked. And then explained that, in those days, Sudan’s capital, located at the confluence of the White and Blue Nile rivers, was still a backwater on the edge of the Sahara. The city was made up of single-storey mud brick dwellings that made the city hardly distinguishable from the soil on which it stood. The only architectural exceptions were some churches and the administration buildings that were still left over from Anglo-Egyptian colonial times. This all came to an end in 1956 with national independence. Since then, the country’s development has closely followed that of so many post-colonial countries, including the extreme social inequality and the urban-rural divide. The glittering high rises of glass only serve to accentuate the stark contrast to the misery being suffered by other parts of the population. As the plane begins its descent to the airport located in the middle of the city, the tin roofs of the shanty towns blaze in the relentless glare of the summer sun. Hundreds of thousands moved to the capital from rural areas in their search for a better life and are now carving out a meagre existence at its fringes. President Omar Hassan al-Bashir has ruled the country since 1989, which in and of itself is already a feat. The period when rival fractions of the army regularly staged coups against each other – the source of the trauma of the priests gathered for their evening meal – ended with this last coup. At least in Khartoum. Because even after almost thirty years of al-Bashir’s government, peace is practically unheard of in the country. Turmoil reigns in every corner of this multi-ethnic state, caused by ethnic conflicts, struggles over the distribution of oil, pastureland and other resources as well as religious tensions. The east was embroiled in conflict up until a few years ago, when an agreement was reached by Khartoum and the Eastern Front. In the south, the government is regularly dropping bombs on opposition groups in the South Kordofan region. And in the west, in Darfur, the conflict cost hundreds of thousands of people their lives. An international arrest warrant has been issued for al-Bashir on charges of war crimes and crimes against humanity committed by the government in this region. Amnesty International claims to have evidence that the government army even used chemical weapons against the people during the last year. However, the bloodiest conflict is currently taking place there, where Sudan’s black south once was. After South Sudan gained independence in 2011, the youngest country in the world descended into a bloody civil war. Warring ethnic groups – the Nuer and Dinka people – began to wage war against each other with what was at times inhumane brutality. Until just recently, the country was at the very brink of a hunger catastrophe. Hundreds of thousands of refugees pushed back north, which they had left because they felt they were being discriminated against on the basis of skin colour and religion. Many Arab North Sudanese still call the black people of the south, regardless of whether they are Christians or followers of one of the African religions, “abd”, or slave. And many were practically enslaved in the north. Christian human rights groups pressured the US government to step in for the independence of South Sudan. And that is what happened. This is why Sudan, once Africa’s largest territorial state, is now just a torso. Now that the south has gained independence, the north has become even more Arab, even more Muslim. There are only a few native Christians in the more than 90 per cent Sunni north. They come from the sub-Saharan Nuba Mountains in the southern part of what is today North Sudan or from the state of Blue Nile. The rest are descendants of Egyptian or Levantine immigrants from the time when the Arab world knew no borders. Most of the Christians living in the north come from the south. Their situation in the north is extremely precarious because they lost their citizenship through the secession of the south. The Roman Catholic church is the largest of the churches. It gained a foothold in the 19th century, scattering the Seed of the Word in an uncultivated field. Because after centuries of Islamic hegemony, nothing but ruins were left of the Christian kingdoms that had once existed on Sudanese soil for hundreds of years, beginning in Ancient times. Meanwhile, the British colonists tried to avoid religious tensions between Muslims and Christian missionaries and diverted the Christian missionary efforts to the south. They supposedly even had the grave of Daniele Comboni destroyed to prevent a pilgrimage. Historically, the form of Islam practiced in the north is not considered a radical one. “My aunt is Muslim. But she always slaughters a pig for me on Christmas,” a Catholic cleric from the Nuba Mountains remarked, describing the religious tolerance one sees in day-to-day life. In general, Sudan does not seem to have a fanatic Islamic population. The veils of the women are often carelessly draped. The people, it seems, have enough to do with organising their daily lives and survival that they are not worrying about the observance of Sharia law in every aspect of their daily lives. A severe economic crisis has shaken the country, largely due to the secession of the south. The secession cost Khartoum 75 per cent of its oil revenue, about 30 per cent of the overall national budget. This led to cuts in energy and food subsidies. A potential for unrest. Which is why the ever-present police state is being especially vigilant. Meanwhile, Sharia has now become the law of the land all the way through to the penal code, which includes floggings and other corporal punishments. The renunciation of Islam is a capital crime. As is blasphemy or insulting the prophet and his companions. Sudan’s foreign policy may recently have become less aggressively Islamic – in the 1990s, terrorist leader Bin Laden stayed for some time in the country – but little has changed in its interior. However, as long as they are members of registered communities, non-Muslims can usually practice their faiths without constant harassment. But things are a little more difficult for the representatives of unregistered communities, such as the evangelical free churches. Just recently, Czech preacher Petr Jasek was pardoned by the president after being sentenced to 23 years in prison. The man had been accused of spying. In reality, though, it was because he had aggressively proselytised among Muslims – a red line. However, even registered churches are strongly discriminated against. The country is still a long way from the religious freedom guaranteed by the constitution. “Churches are being torn down each month,” a cleric said. “You never hear that about mosques. And if, then because they had to make room for a street and the mosque is rebuilt somewhere else.” Approval to build new churches is practically never granted. The church manages by using multipurpose buildings for divine services. The Catholic Church in particular despite massive discrimination is on fair terms with the government because of its charitable endeavours. Hospitals and more importantly schools relieve the burden of the state, making it more amenable to the concerns of the church. Especially prestigious schools are even attended by the children of ministry officials. This is not a disadvantage in a country where “friendship” is the underlying force of all things. This may be the reason why the state tolerates the large number of clerics from the south who lost their Sudanese citizenship through independence, transforming them into foreigners in the north. Visa-issues for foreign clergy remain a huge problem for the church though. In spite of the many governmental restrictions, however, the church is actually its own worst enemy. Financially, the church is completely dependent on the support of the world church, the clergy is spiritually burnt out, tribal rivalries are often more important than communion in the body of Christ. “We are only at the very beginning of evangelisation here,” Archbishop Michael Didi of Khartoum confirmed to Aid to the church in Need. He has been the head of the national church since November 2016. “Up until now, we primarily focused on the figures. It was considered a success when a large number of people had come to be baptised. 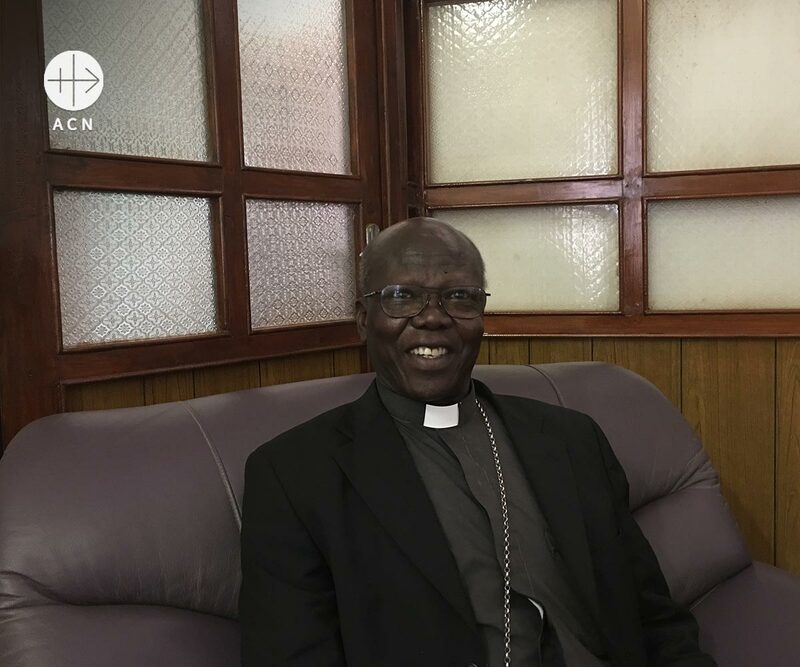 However, we baptised so many heathens without there having been a conversion,” the spiritual leader from the Nuba Mountains and thus one of the few native Christian North Sudanese, said. “Many people also misunderstand Holy Baptism. They bring their children to be baptised because they are sick and the parents believe that baptism will bring healing. But that is not the proper attitude. It shows us that the faith has not really taken root. Moreover, our local traditions are very strong,” In concrete terms, this means: going to Mass and then visiting a witch are not considered mutually exclusive.